18 Years of Contractor Experience - Call Now! For over 18 years, Spring Canyon Homes has provided quality new home construction, renovations, and remodeling services to Western Colorado. We also specialize in building log cabin homes. Whatever style or size, we have the experience and skill to make your dream home a reality. Want to build a new home, or remodel your current one? Call (970) 497-1012 today for a free estimate on your project. 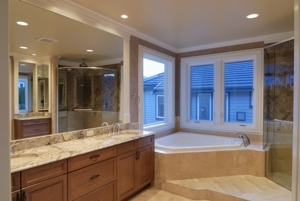 From new window installation, to custom bathrooms and kitchens, Spring Canyon Homes can handle any remodel or home improvement project. We have a team of experienced craftsmen, including expert cabinet makers, to enhance your home improvement project with the very finest attention to detail. From design to project completion, we manage new home construction start to finish. We use only the highest quality materials, and skilled workmen, to ensure you are 100% satisfied with the end result. Not only are we committed to the highest building standards, but we strive to deliver exceptional customer care on every project. We’ll work with you every step of the way to make sure we deliver on-time and on-budget a home you will love inside and out. Spring Canyon Homes offers full service log cabin construction. We buy our logs directly from the mill, and offer a variety of service options. We can build your log cabin from the ground up. We can work with your existing contractor to assemble our logs on your foundation. We can also custom design a log cabin package for you, including blue prints and instructions for an owner build. Our greatest gift is our level of craftsmanship, dedication, and expertise that our contractors possess. We have integrated integrity, attention to detail, and honesty each step of the way. Choosing a contractor that best suits your vision is a major undertaking, but with Spring Canyon Homes, you get a team you count on.